Querying XML has been the subject of much recent investigation. 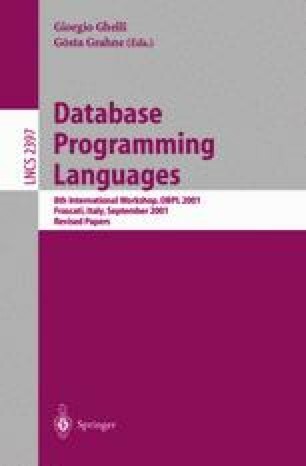 A formal bulk algebra is essential for applying database-style optimization to XML queries. We develop such an algebra, called TAX (Tree Algebra for XML), for manipulating XML data, modeled as forests of labeled ordered trees. Motivated both by aesthetic considerations of intuitiveness, and by efficient computability and amenability to optimization, we develop TAX as a natural extension of relational algebra, with a small set of operators. TAX is complete for relational algebra extended with aggregation, and can express most queries expressible in popular XML query languages. It forms the basis for the Timber XML database system currently under development by us.